With Tiger Woods winning on Sunday at the Arnold Palmer Invitational, it has sent the golfing world into a frenzy. It has been a long time since the buzz surrounding the PGA Tour has been this high, with the 2012 season being one of the most-successful in history through 4 months. And we haven’t even played a major championship! But with the Masters less than two weeks away, it’s a good time to be a fan of golf right now. Woods’ five-shot victory brought back memories of old, as it seemed like ages ago he was winning. It’s his fault though really, as we fans grew accustomed to Woods winning virtually every other tournament in which he was entered. A victim of his own success. But now that he has won again, the expectations and pressure still hasn’t dwindled. It has only expanded. That is because we hold Woods in such high regard on the golf course. He is the standard. And frankly anything else other than a win at Augusta in two weeks would be considered a bitter disappointment. The odds are favoring Woods to win, going off at 7/2 on Masters Betting Lines available at Bovada Sportsbook. But in addition to the overall odds to win the Masters, Woods has also been set with several other prop odds for the 2012 PGA Tour season. The first is the total number of wins. The over/under total has been set at three. With one under his belt already, three more victories would take the over, with exactly three wins resulting in a push. At the three-win total, the over is set at -150 in the role of the favorite, with the under set at +110. 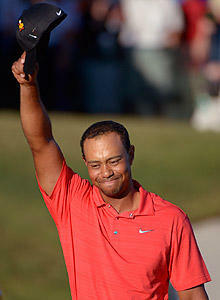 A second wager relating to Woods’ win total this season are the number of Major victories in 2012. While the odds say that he will not win one, exactly one major championship win is going off at +188 leading the way after no major wins. Two major wins is going off at +800, three at +3300, and four at +6600. This entry was posted in PGA Tour Betting Odds and tagged 2012 masters, masters betting odds, the masters, tiger woods, tiger woods masters odds on March 26, 2012 by Bryan.